Yay, the weather gets cool and a craving for sugar and spice takes hold. I spent an evening with my favorite Glam Network bloggers to indulge in Bailey's Cinnamon Vanilla. 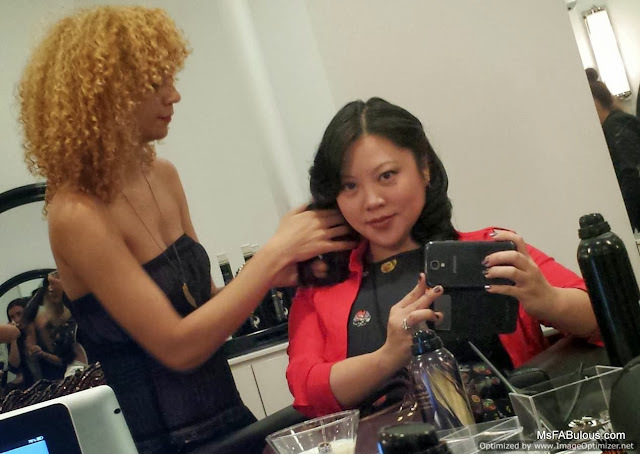 I couldn't ask for a better girl's night out, getting pampered at the DreamDry salon in the Flatiron district and plied with treats. 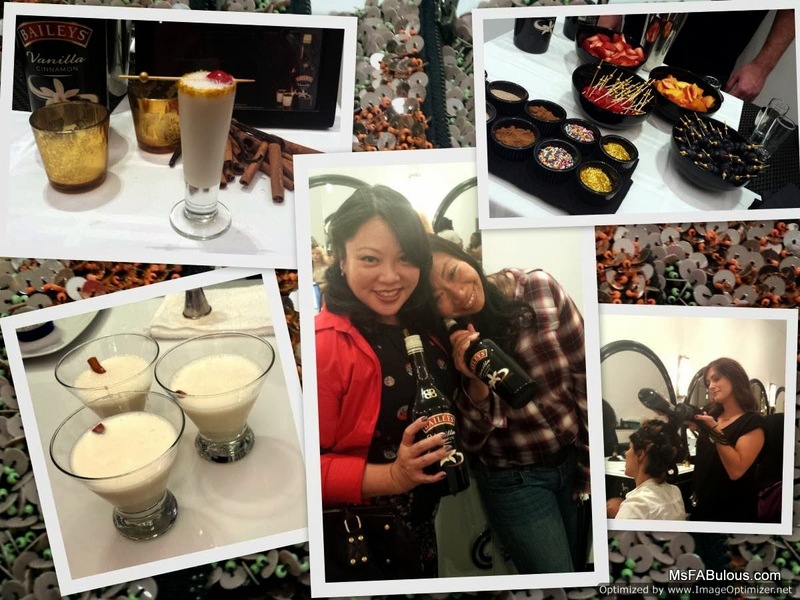 As this was an event where beauty and fashion bloggers gathered to augment their glamour, the fine mixologists of Bailey's offered a styling bar for your cocktail. You could create your "glamour shot" by embellishing your glass with a choice of rims like gold dust, sprinkles, spiced sugar or coconut. Then, you select a complementing liqueur like Amaretto or Goldschlager to blend with your Bailey's Cinnamon Vanilla. Top of your treat with a skewered cherries, blueberries or peaches. In the fall, you can't walk into any culinary destination without being hit over the head with pumpkin flavors. Let's face it, there is no pumpkin. What you really crave are the spices and richness of vanilla to bring that cozy autumn taste. Bailey's new Cinnamon Vanilla can make any drink your favorite dessert in a glass. Yum. The DreamDry salon is a relative newcomer in the blowdry bar business. They have a posh setting where you choose your favorite hairstyle inspired by celebrity style icons. I got the "Veronica" for classic Hollywood glamour. My girlfriend chose the wild "Stevie" and lived up to her muse by the end of the night. The salon also has a back room of talented make-up artists to complete the canvas that is you. In the theme of taking your glamour shot, there was a very popular photo booth (a.k.a. blogger's Kryptonite) in the middle of the venue. Everyone vamped for the multi-shot camera which also generated a lovely gif. If you want to see my gratuitous "selfie", click here. With parties and ladies nights in I can't wait to try out some recipes and experiment with my own! Which creation would YOU like to try? (Recipes here). Baileys Vanilla Cinnamon. Stay Stylish. Drink Responsibly. Disclosure: Compensation was provided by Diageo via Glam Media. The opinions expressed herein are those of the author and are not indicative of the opinions or positions of Diageo.